The subject of this project is the trilobite, specifically the Ceraurus genus that scuttled around Earth some 470 to 475 million years ago. The idea behind printing the fossil was to take something that most people have only seen as a flat imprint and bring it to life in three dimensions. The Ceraurus trilobite was a perfect choice because its structure is detailed enough to yield an impressive final product yet still sturdy enough to survive the recreation process. Drummond started by drawing out a sketch of the creature, once in pencil then again using the graphics software Inkscape. This provided the blueprints for the 3D modeling, which was then used to print out the plastic components. Each piece had to be broken away from its base, polished, and assembled into the final form. 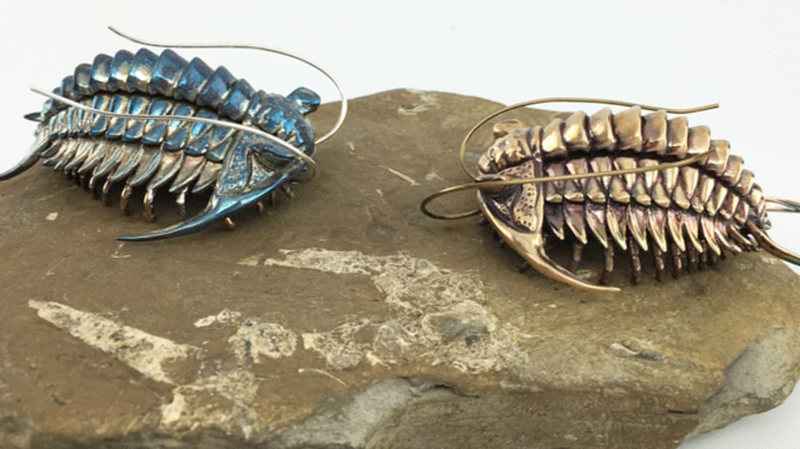 The last step was to finish the trilobites by casting them in steel, bronze, and silver. The result is an impressive collection of prehistoric bling. You can check out his pictures below, and read more about the process from his posts on the Fossil Forum. All images courtesy of Allan Drummond.